This beautiful model home is now available for sale. An amazing $17,500 in upgrades have been installed and include - heat pump, irrigation system, pre-wired for security system, audio distribution system, custom blinds and Whirlpool refrigerator. For more information on price and availability of this home please contact our leasing agent Trena Kupper 206-310-2668. 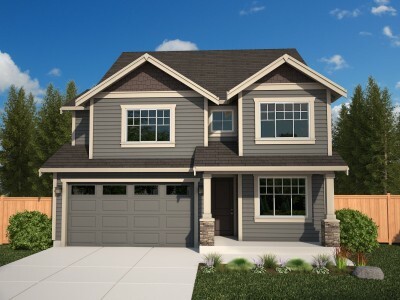 The Hemlock offers a multi floor layout to accommodate that extra space needed for larger families. The main floor begins with a private den upon entering, followed by a powder room complete with shower. The expansive great room with gas fireplace meets the well-designed kitchen and dining area and flows to your private covered patio. Upstairs you will find a well-appointed master suite with five-piece bath featuring a luxurious corner soaking tub, large tiled shower, wardrobe mirror and spacious walk-in closet. Three additional bedrooms, a full bath with double sinks, and centrally located utility room complete the second floor. An oversized bonus room offered on the third floor.